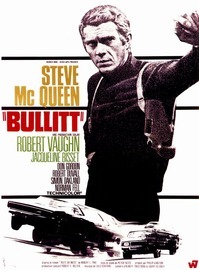 Bullitt is a 1968 thriller film directed by Peter Yates and produced by Philip D'Antoni. It stars Steve McQueen, Robert Vaughn, and Jacqueline Bisset. The screenplay by Alan R. Trustman and Harry Kleiner was based on the 1963 novel, Mute Witness, by Robert L. Fish, writing under the pseudonym Robert L. Pike. Lalo Schifrin wrote the original jazz-inspired score, arranged for brass and percussion. Robert Duvall has a small part as a cab driver who provides information to McQueen.